How would you portray the world from a nonviolent perspective if someone handed you a video camera and told you to focus it on one subject for five minutes? That’s the concept behind “Sitting Still for Art and Empathy,” a video art project developed by Anne Beffel, associate professor of art at Syracuse University. The project was launched in early 2008, and since then it has grown in scope to include two museums, two universities, numerous high school students and even SU’s School of Information Studies (iSchool). Beffel was inspired by the likes of Gandhi, the Dalai Lama and Rosa Parks, all famous figures known for using contemplative practices and nonviolent methods of fostering peace in times of conflict. With “Sitting Still,” Beffel wanted to create a project that forced people to stop, look, listen to and contemplate their surroundings. Beffel first launched the project in Memphis. She asked students at the University of Memphis and Overton High School for the Creative and Performing Arts to film five-minute videos of scenes from their everyday lives. Beffel had the students watch each other’s clips, meditate on them and then film a video response to each one. Beffel also got her art students at Syracuse University involved in the mix. Soon all of the students were trading video clips back and forth and filming responses to each other’s work. Following this initial success, “Sitting Still” gathered both momentum and exposure. The project was awarded two grants, one from the Center for Contemplative Mind in Society and an Enitiative grant from the Kauffman Foundation. In spring 2008, the Art Museum of the University of Memphis (AMUM) staged an exhibition of the project. Each film clip was matched up with its response, and the video pairings were shown side-by-side on the same screen. After the AMUM exhibition, Beffel moved the project back to Syracuse and got even more local students participating. During fall 2008 and spring 2009, “Sitting Still” expanded to include students from six Syracuse-area high schools (East Syracuse-Minoa, Henninger, Nottingham, Corcoran, the Institute of Technology at Syracuse Central and West Genesee) as well as more SU students enrolled in Beffel’s “Art Foundation” and “Contemplative Arts” courses. And what better way to spread the message of peace and humanity than to use the World Wide Web? Beffel decided to take “Sitting Still” global by creating an interactive website. But she needed help with the technical side of the site, so she contacted iSchool professor of practice Susan Dischiave. Dischiave jumped on board with energy and enthusiasm. “It’s such a wonderful project,” she says, “and it’s also an interesting technical challenge.” Beffel asked Dischiave to create a database on the back end of the site that stores the videos and enables web site visitors to search for (and view) particular clips or pairings of clips. The website will also allow users to upload their own video responses to the website’s clips. Dischiave enlisted the help of a handful of students, all of whom had taken her “Database Administration Concepts and Database Management” graduate course. The students are using the skills they learned in the classroom and applying them to a real-world situation. 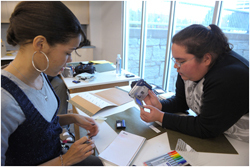 They are also donating their time, receiving little or no course credit for their work. The students—Supriya Tardalkar G’09, Hirav Shah G’10, Aditya Sridhar G’10, Amit Gupta G’10, Sumit Bansal G’10, Pradeep Prabhaka G’10 and Mike Shenouda G’10—are all enrolled in the iSchool’s M.S. in information management program. Some of them spent their free time this summer working on the database. Beffel and Dischiave have applied for a grant from the National Endowment for the Arts to help fund the website project. Their grant application is still pending. In the meantime, world-renowned artist Alex Villar recently agreed to design the site. After the design and back-end database are finished, the site will undergo user testing before finally being unveiled to the public.